This would be the fourth week of the Bengals' offseason conditioning program if there had not been an NFL lockout. 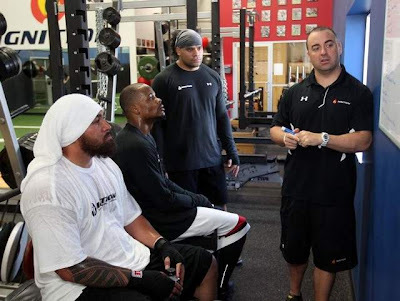 Even though most of the Bengals are working out away from Cincinnati, defensive tackles Domata Peko and Tank Johnson, linebacker Rey Maualuga and wide receiver Jerome Simpson have been training at Ignition APG in Mason. Ignition’s performance director Clif Marshall worked for the Bengals for three seasons and continues to work with the team during the offseason on speed drills. This normally would be Marshall’s slow time of the year after working with draft prospects to prepare for the Scouting Combine and their Pro Days. But starting In February, Marshall received calls from players looking for places to work out in case of a lockout. While some, like Bengals player rep Andrew Whitworth, has worried about if players are sticking as close as possible to their workout routines, Marshall says the players know what’s at stake if they don’t. Marshall has designed a conditioning program that prepares players in case of shortened training camps and no preseason preparation. Normally there are 5-6 weeks of offseason conditioning followed by five weeks of organized team activities and a mandatory three-day minicamp. This year it might be straight to training camp. Judge Susan Richard Nelson is expected to rule on the players’ injunction to lift the lockout next week, but that decision will likely will be appealed by the losing side. The players and owners began court-order mediation on Thursday. Peko has already noticed an improvement and has called it one of his best seasons so far. Simpson also noted that he was in better shape this year compared to this point last year. In addition to the Bengals, John Conner of the New York Jets, Connor Barwin of Houston, Tyjuan Hagler of the Colts, and Akwasi Owusu-Ansah of Dallas are working out at Ignition. Others Bengals working out locally include cornerback Leon Hall, fullback Fui Vakapuna and offensive guard Otis Hudson, who are training at D1 in West Chester. Peko hopes that more Bengals are in the area town by the end of the month and that they can work out as a team. Although not much football work is done this time of year, quarterback Jordan Palmer is getting the receivers together the week of April 25 for some on-field work. When ever the lockout ends. and players can return to team facilities, Bengals union representative Andrew Whitworth hopes everyone is ready. Johnson, who is rehabilitating from a knee injury, realizes the lockout can’t stop players for preparing for the season. While plenty of players have shared views on the labor unrest, Johnson has decided staying silent is better.